Explain Bohr’s model of atom. Define and describe quantization of angular momentum. Calculate the angular momentum for an orbit of atom. Define and describe the wave-like properties of matter. After visiting some of the applications of different aspects of atomic physics, we now return to the basic theory that was built upon Bohr’s atom. Einstein once said it was important to keep asking the questions we eventually teach children not to ask. Why is angular momentum quantized? You already know the answer. Electrons have wave-like properties, as de Broglie later proposed. They can exist only where they interfere constructively, and only certain orbits meet proper conditions, as we shall see in the next module. Following Bohr’s initial work on the hydrogen atom, a decade was to pass before de Broglie proposed that matter has wave properties. The wave-like properties of matter were subsequently confirmed by observations of electron interference when scattered from crystals. Electrons can exist only in locations where they interfere constructively. How does this affect electrons in atomic orbits? When an electron is bound to an atom, its wavelength must fit into a small space, something like a standing wave on a string. (See Figure 1.) Allowed orbits are those orbits in which an electron constructively interferes with itself. Not all orbits produce constructive interference. Thus only certain orbits are allowed—the orbits are quantized. Figure 1. (a) Waves on a string have a wavelength related to the length of the string, allowing them to interfere constructively. (b) If we imagine the string bent into a closed circle, we get a rough idea of how electrons in circular orbits can interfere constructively. (c) If the wavelength does not fit into the circumference, the electron interferes destructively; it cannot exist in such an orbit. This is what Bohr was forced to hypothesize as the rule for allowed orbits, as stated earlier. 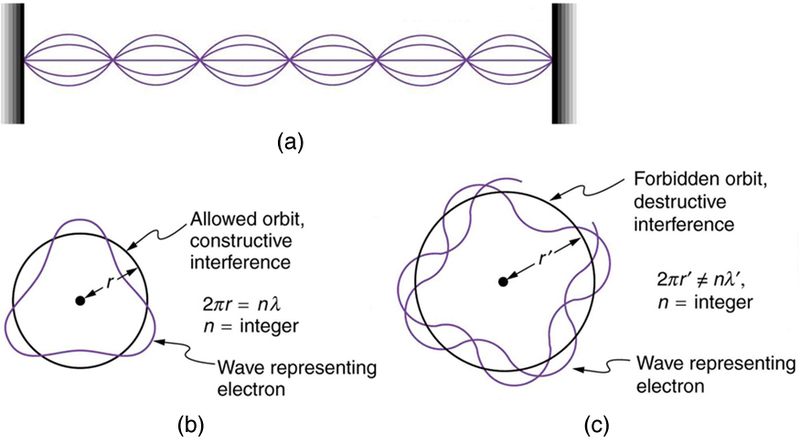 We now realize that it is the condition for constructive interference of an electron in a circular orbit. 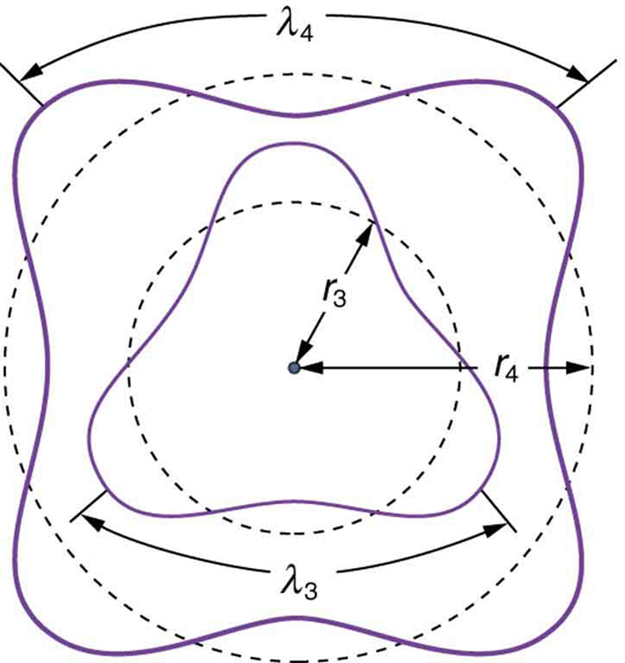 Figure 2 illustrates this for and . The wave nature of matter is responsible for the quantization of energy levels in bound systems. Only those states where matter interferes constructively exist, or are “allowed.” Since there is a lowest orbit where this is possible in an atom, the electron cannot spiral into the nucleus. It cannot exist closer to or inside the nucleus. The wave nature of matter is what prevents matter from collapsing and gives atoms their sizes. Figure 2. The third and fourth allowed circular orbits have three and four wavelengths, respectively, in their circumferences. Because of the wave character of matter, the idea of well-defined orbits gives way to a model in which there is a cloud of probability, consistent with Heisenberg’s uncertainty principle. Figure 3 shows how this applies to the ground state of hydrogen. If you try to follow the electron in some well-defined orbit using a probe that has a small enough wavelength to get some details, you will instead knock the electron out of its orbit. Each measurement of the electron’s position will find it to be in a definite location somewhere near the nucleus. Repeated measurements reveal a cloud of probability like that in the figure, with each speck the location determined by a single measurement. There is not a well-defined, circular-orbit type of distribution. Nature again proves to be different on a small scale than on a macroscopic scale. Figure 3. 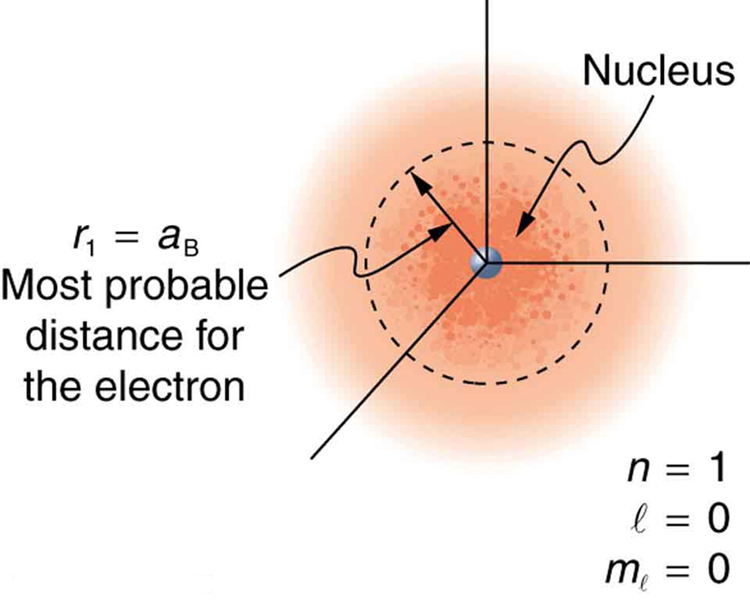 The ground state of a hydrogen atom has a probability cloud describing the position of its electron. The probability of finding the electron is proportional to the darkness of the cloud. The electron can be closer or farther than the Bohr radius, but it is very unlikely to be a great distance from the nucleus. There are many examples in which the wave nature of matter causes quantization in bound systems such as the atom. Whenever a particle is confined or bound to a small space, its allowed wavelengths are those which fit into that space. For example, the particle in a box model describes a particle free to move in a small space surrounded by impenetrable barriers. This is true in blackbody radiators (atoms and molecules) as well as in atomic and molecular spectra. Various atoms and molecules will have different sets of electron orbits, depending on the size and complexity of the system. When a system is large, such as a grain of sand, the tiny particle waves in it can fit in so many ways that it becomes impossible to see that the allowed states are discrete. Thus the correspondence principle is satisfied. As systems become large, they gradually look less grainy, and quantization becomes less evident. Unbound systems (small or not), such as an electron freed from an atom, do not have quantized energies, since their wavelengths are not constrained to fit in a certain volume. where is the electron’s de Broglie wavelength. Owing to the wave nature of electrons and the Heisenberg uncertainty principle, there are no well-defined orbits; rather, there are clouds of probability. where is the change in energy between the initial and final orbits and is the energy of an absorbed or emitted photon. It is useful to plot orbit energies on a vertical graph called an energy-level diagram. where is the angular momentum, is the radius of orbit , and is Planck’s constant. 1: How is the de Broglie wavelength of electrons related to the quantization of their orbits in atoms and molecules? 30.6 The Wave Nature of Matter Causes Quantization by OpenStax is licensed under a Creative Commons Attribution 4.0 International License, except where otherwise noted.